Any length of hull can be produced from 8 to 11 metres in our standard mould, accommodating both inboard and outboard power options (outboards and stern drives only on vessel lengths under 10 metres). There is also the option to produce extended hulls up to 13 metres in length, all with the same beam of 4.2 metres. POA. We provide a standard engine package with our S.P.E.E.D. design as part of our basic ‘turn key’ product — see ‘Engine options’ for more information. We can provide TWO wheelhose options:- Full Width or Lantern style — see ‘Wheelhouse Options’ for more information. Included in our standard ‘Charter spec’ package are twin 200Hp Common Rail Toyota based Nanni units, although other manufacturer’s engines of customer choice can be fitted, dependent on physical size. We are able to accomodate conventional shaft, Sterndrive and Jet propulsion options with diesel inboards. 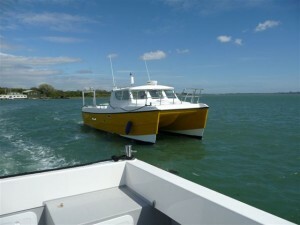 As a unique feature of our design, our hull is also equally happy to be powered by outboard engines, from twin 90Hp right up to twin 350Hp. 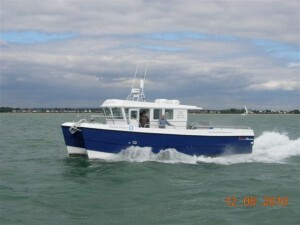 Wheelhouse options are full width with rear door or a lantern style walk around unit, which can be produced in various lengths and access from the rear or sides.